Firstly I’m sorry for my disheveled look and undone hair but I went from Crossfit (with a migraine inducing WOD no less), straight to school with my kids, then to the mall and so today I look a bit ‘undone’. Anyways. 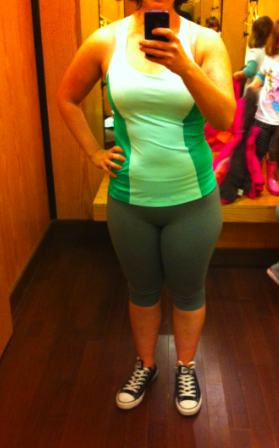 There wasn’t a whole lot new in store today but I did see the new Sour Apple Green in the Run: Pace Tank and I love the color. It’s pretty much identical to the packaging of the Pantone Emerald Green items out at Sephora. I picked up the nail polish today and it’s literally the same shade of creamy emerald. Super excited about this one. 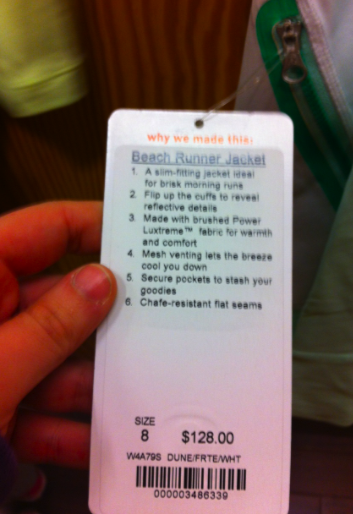 The Beach Runner Jacket was deliciously soft on the inside since it’s brushed power luxtreme, but I just grabbed the one size (size 8, sized down) and I wasn’t really in love with the overall design. I wish we’d gotten a Pump It Up Jacket in solid Sour Apple Green. 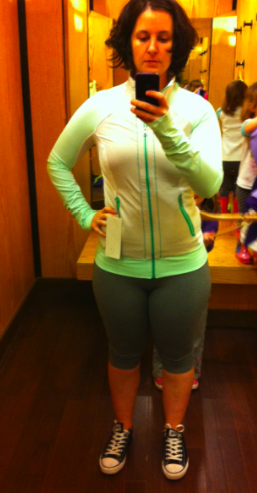 The Beach Runner Jacket has a really cute cuffed hem which I love, but I wish the bolder Sour Apple Green had been the primary color. The three tone color blocking just wasn’t working for me. Had I loved it, I would have gone with my TTS 10 rather than the 8, although the 8 was passable. 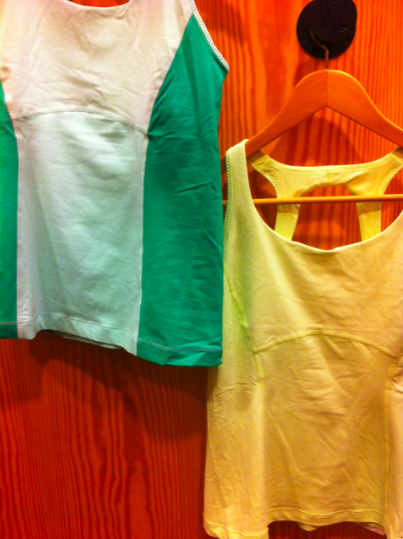 As I said above, I loved Sour Apple Green on this, but I hate this tank. It’s really short on me and too huggy around my midsection. Sour Apple Green with Fresh Teal next to Faded Zap. I decided Fresh Teal was ‘ok’ but it’s so similar to mint moment and I passed on that color when it was out. I didn’t dislike it but when you see similar colors out that often (aquamarine, mine moment, fresh teal) it’s just not special enough unless it looks stunning on you. I do plan on getting something in Faded Zap, preferably an Energy Bra. "A Glimpse At New Print: Fresh Teal Groovy Run Shorts"